Global chief communications officers (CCOs) are increasingly adding digital and social media into their department oversight and responsibilities. Chief communications officers (CCOs) report that compared to years past, they are hiring more digital and social media experts and developing more relationships with influential Twitter users and bloggers. The findings come from ‘The Rising CCO V’, a survey conducted by global executive search firm Spencer Stuart and global public relations firm Weber Shandwick. Now in its fifth year, ‘The Rising CCO’ explores how CCOs expect their responsibilities to evolve over time in an increasingly digitalised and media-fragmented world. Social media is expected to have the single greatest impact on the CCO’s job over the next few years. An overwhelming 91% of CCOs expect social media to increase in importance more than other communications responsibilities. This finding is consistent across every region in the study, which includes North America, Europe, Asia Pacific and Latin America. Globally, CCOs expect mobile (73%) and video production (69%) to also increase the most in importance. The vast majority of CCOs (86%) agree that the changes in the media environment in the past few years have had a significant impact on communications strategies, and they expect the landscape to continue to evolve. 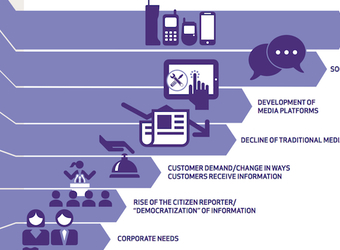 More than one quarter of global CCOs (28%) expect the media environment to change extensively over the next few years. Another 51% are moderately bullish about change to come. When asked to describe in their own words why they think the media environment will change, CCOs most frequently cited technological advancements, social media and developing media platforms. One way the changing media environment is likely to impact corporate communications is through content publishing. 90% of CCOs have content publishing on their agendas. 58% of CCOs report that they create and publish their own content, 18% report that they are in the process of preparing to become an original content publisher, and 14% say they are considering becoming an original content publisher as a future initiative. CCOs have greater responsibility for marketing today compared to several years ago. The rate of global CCOs who have oversight for marketing increased from 26% in 2012 to 35% in 2014, a 35% increase. 84% of global CCOs agree that corporate reputation and brand reputation are indivisible today. Likely closely associated with this relationship is a rise in reported prominence of public relations as a marketing mix component. 62% of CCOs agree that public relations has risen in status in the marketing mix over the past few years. Global chief communications officers (CCOs) report that their external communications focus more on traditional media (64%) than social media (36%). CCOs use traditional and social media for different purposes and see effectiveness in integrating both for some communications activities, including crisis resolution, and not for others. Nearly two-thirds of CCOs (63%) find traditional and social media to be equally effective for resolving a crisis or issue. At least half of global CCOs report that traditional and social media are equally effective for retaining customers (58%), attracting new customers (54%) and creating awareness of a new product or service (50%). Traditional media is viewed as more effective for announcing financial performance (76%) and promoting the visibility of senior executives (54%), while social media is more effective for attracting talent (56%).